but were miserable then, then, then! There are two bands called Spector. 1. Spector the five piece band from Dalston, London. 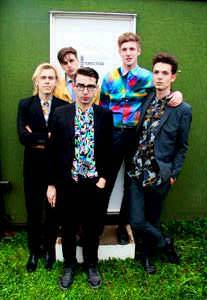 Made up of Frederick Macpherson, Christopher Burman, Thomas Shickle, Danny Blandy and Jed Cullen The band, who are fronted by former Les Incompetents and Ox.Eagle.Lion.Man singer Fred MacPherson, will be supporting Florence And The Machine on their forthcoming arena tour. They will join The Horrors on the jaunt, which kicks off in March 2012 http://www.spector.co.uk/ .